Drive adoption and collect user feedback. Measure results and summarize them for your company. Establish processes that will help you evolve your mobile implementation. Migrate, then test. If you migrated your mobile customizations from your sandbox to your production environment, test everything again to make sure the Salesforce app is working as expected. Control access. By default, all users have access to the Salesforce app. If you’re doing a phased rollout, define which employees can use the mobile app during this stage of your rollout. See the Salesforce Mobile App Security and Compliance module for details. Collect a baseline. Take an analytic snapshot of the metrics your company is using to define success. Then you can use that data as a baseline for measuring the business impact of your rollout. Take it to Chatter. Create a public, company-wide Chatter group where your users can ask questions about the mobile app and access training materials. Make sure your super users are engaged and ready to swarm on the questions that get posted in the group. OK, now it’s time to flip that switch. We’ll let you do the honors. Ready… set… GO! Seriously! Start basking. We know how hard Salesforce admins work. Rolling out mobile to your organization is quite an accomplishment, so take a moment to celebrate your own awesomeness. Pat yourself on the back. Treat yourself to a massage. Eat an extra bowl of ice cream for dessert. Hey, you earned it! If you’ve ever been involved in a product launch before—whether internal or external—then you’re probably familiar with this scenario: During the launch event, you see a huge spike in logins and activity. Yay! But after the confetti settles and the initial fanfare is over, you see a decline in usage. Boo. Not to worry. That’s natural. But there are things you can do to motivate your users and get them back into the mobile app. Produce helpful content. After the launch, continue to release short one-minute recorded screenshares that promote time-saving features available in the Salesforce app. Don’t stop marketing. 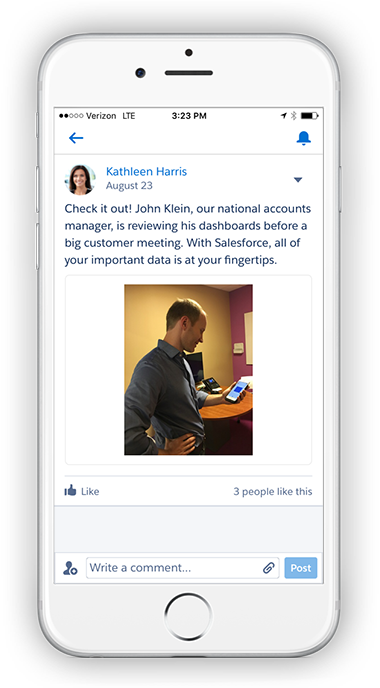 Your mobile users will probably start telling you about moments when the Salesforce app saved the day. Share those mobile success stories on Chatter, including a photo of the user in action. Get a testimonial from a few executives as employees follow the example set by their leaders. Get organic exposure. Why take photos of your users when they’d be happy to do it themselves? It’s the selfie era! Have a contest on Chatter and ask mobile users to post photos of themselves using the app, with a prize for the most likes. Not only does that give your users a chance to shine, it also creates buzz about the mobile app. Make it a game. Ignite some friendly competition among your users by running a login report, and then doling out cool prizes to users with the most mobile logins. Create a dashboard for the contest leaderboard. Use sales as an incentive. If you rolled out the Salesforce app to your sales team, you can use the current sales contest or selling initiative to drive mobile adoption. Create a dashboard that shows how the sales reps are performing against their goal, and the reps will be motivated to check the dashboard in the Salesforce app. Another great way to boost your organization’s mobile adoption is to use Adoption Manager. We turned this off during our pilot, but now’s the time for it to shine. Adoption Manager has a proven track record of success when it comes to driving adoption. To re-enable Adoption Manager, go to Setup in the full Salesforce site. Enter Adoption in the Quick Find box, select Adoption Manager, and then select Enable Salesforce Adoption Manager. Curious about the emails that Adoption Manager sends to your users? Check out this video if you’d like to see Adoption Manager in action. Here are some ideas for gathering feedback from users. Take it to Chatter. 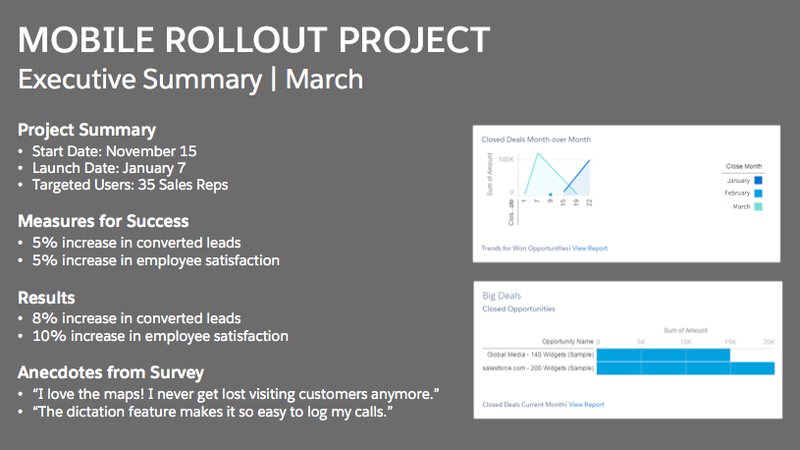 Use the Chatter group you created to support your mobile rollout. Employees can post ideas and suggestions there. Make it easy. Allow users to provide input directly from the Salesforce app. You can use the standard case object or implement your own solution, like a Mobile Feedback custom object, a quick action, or a Visualforce page. Provide multiple feedback options. Send out surveys, host open forums, or conduct simple Chatter polls. Keep in contact. Meet with your super users regularly to gather valuable insights from the field. Also, don’t forget to update your training programs for new hires! Incorporate the Salesforce app into your existing Salesforce onboarding activities. When you were planning your rollout strategy, you worked with your executive sponsor and stakeholders to determine your success metrics. Now that you’ve rolled out the Salesforce app, it’s time to review your metrics and figure out exactly how you want to measure them. If your metrics include employee satisfaction, you can gather data using some of the methods we already discussed, like surveys, forums, and polls. For other types of metrics, create reports and dashboards to track your results. Take reporting snapshots and start comparing the data month after month to see if there are any increases. We also recommend installing the Salesforce Mobile App Adoption Dashboards and Reports AppExchange package, which contains a dashboard and several reports that will help you measure your company’s mobile adoption. Your executive sponsor has been your project champion from the start. Now it’s time to prepare a summary for them on the overall project status and any results you’re able to share. Include soundbites they can use to showcase return on investment (ROI) for the resources that they allocated for this project. Keep it to 1-2 pages maximum. Well, you did it. With a successful mobile launch, you became a hero to your users and far exceeded the expectations of your stakeholders. But why stop there? Make sure you prioritize your backlog of mobile use cases and enhancements, and revisit the backlog as often as possible to see what other mobile goodies you can roll out to your users. You should also keep up with the Salesforce app releases to see all the cool new features you can implement. And when you’re ready to take the next big step in your organization’s mobile journey, check out the Mobile Strategy Development module on Trailhead. You’ll find out how your company can establish its mobile goals and come up with a plan to achieve them. And of course, the Salesforce platform can help you carry out your mobile vision. But hey, that’s the future. You know...something to think about down the road. For now, just relax and keep basking in the glory of your awesome mobile rollout.